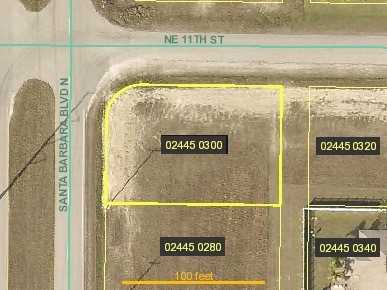 Two adjacent lots FOR SALE = a DOUBLE LOT opportunity in a great location! ($8500) EASTERN EXPOSURE conveniently located on Santa Barbara between Tropicana and Diplomat – Close to shopping, dining and everyday conveniences. Cape Coral’s future area for growth is in the North! Here is your opportunity to get in now. Be sure to request referrals to reputable builders to help you achieve your goal! 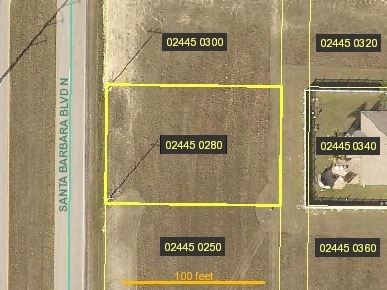 The CORNER LOT directly next door at 1029 Santa Barbara Blvd N. is also FOR SALE. SEEN ABOVE.